CROWLEY, Texas -- Police in northeast Texas are hunting for a murder suspect who they say is on run outside of Fort Worth, reports CBS DFW. Forty-year-old Kristun Madewell is sought in connection with the murder last Friday of Christopher Ortega in south Fort Worth, and has since eluded authorities in several encounters. The 29-year-old Ortega was found dead of a gunshot wound in a bedroom around 4 a.m. Friday, reports the Fort Worth Star-Telegram. Fugitive officers found the suspect early Wednesday in a home in Johnson County, but he fled in a vehicle with a woman before he could be arrested, reports the paper. Investigators later found the vehicle in nearby Godley, where they say Madewell attempted to drive the car into a pasture before fleeing, reports the paper. Police reportedly took the woman into custody. According to CBS DFW, Madewell then stole a pickup truck and led police on a chase into Crowley. The truck was later found ditched, reports the paper. Wednesday, about 100 officers were combing the streets in Crowley, using bloodhounds in the manhunt, reports the paper. Police were asking residents to stay inside and lock their doors. 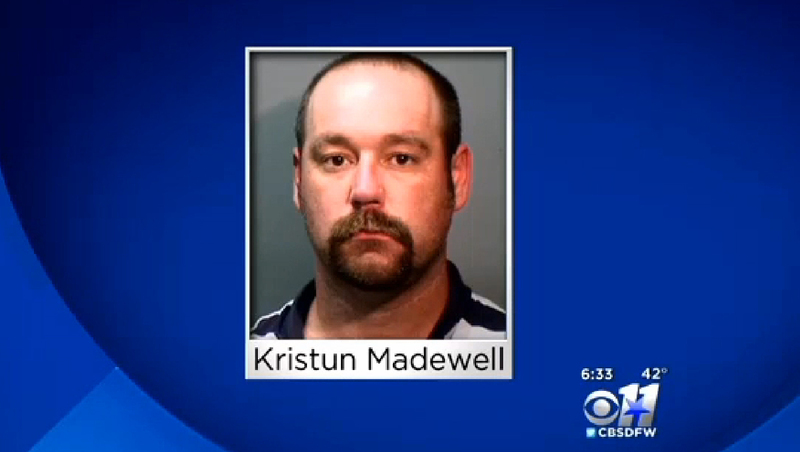 Madewell is described as six feet, two inches tall and 270 pounds with brown hair and brown eyes. Police provided a photo that shows him with a mustache, though he may have shaved it, reports the paper. Anyone with information about his whereabouts is asked to call 911.